Mary Lee was tagged off the coast of Cape Cod. Her tracking device shows she's a fan of New Jersey waters. All 16 feet and 3,456 pounds of Mary Lee, the great white shark is patrolling in the Atlantic – quite probably off the Jersey coast. That’s what her history – she was tagged nearly five years ago – indicates, given the time of year. 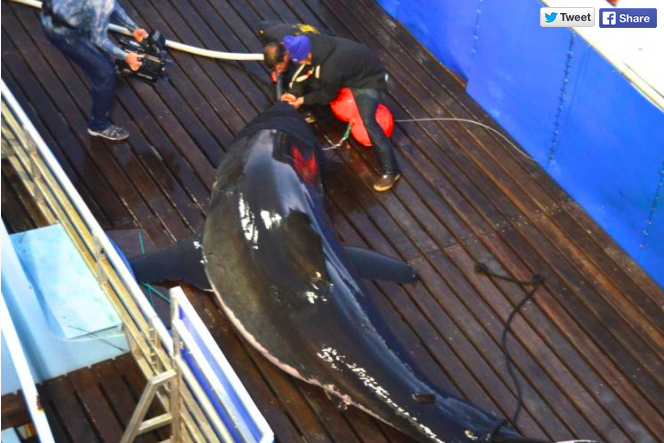 The locator attached to her dorsal fin last “pinged” June 17 at 6:54 a.m. – off the Jersey coast. A location can only be pinpointed if a shark remains above the water’s surface long enough; it's not uncommon for a particular tagged shark not to emit a ping for long periods of time. Like a snowbird, Mary Lee tends to overwinter off the Georgia and South Carolina coasts. Then she generally beelines north in less than a month to the Virginia coast, though farther out to sea. Then it is generally northward, but nearer along the coast, before moving even closer inshore when she hits the Delaware coast. Her summers are usually spent zig-zagging along the Jersey coast, fairly close to shore. Sometimes, though, Mary Lee goes afield. She’s been as far out to sea as Bermuda and as far north as Cape Cod, which is where she was tagged, weighed and measured by OCEARCH, a non-profit organization that conducts research on great whites. Since her tagging, the more than 20-year-old shark has traveled nearly 40,000 miles; Mary Lee can travel 100 to 150 miles in one day. Much of her mileage was logged along the New Jersey coast. A research vessel spent the last several weeks searching for sharks in the Mid-Atlantic. This shot from nature photographer and blogger Susan All was taken off the coast of Wildwood, where the great white shark Mary Lee has tracked. The affinity of several sharks – especially Mary Lee – for the Mid-Atlantic coast drew OCEARCH to sweep the ocean off New Jersey from June 23 to July 13 with a converted Bering Sea crabbing vessel. And while they tagged several new sharks during the voyage, none of the previously tagged sharks, including Mary Lee, that pinged while the expedition was underway. All of which fascinates Susan Allen, a Stockton University employee. 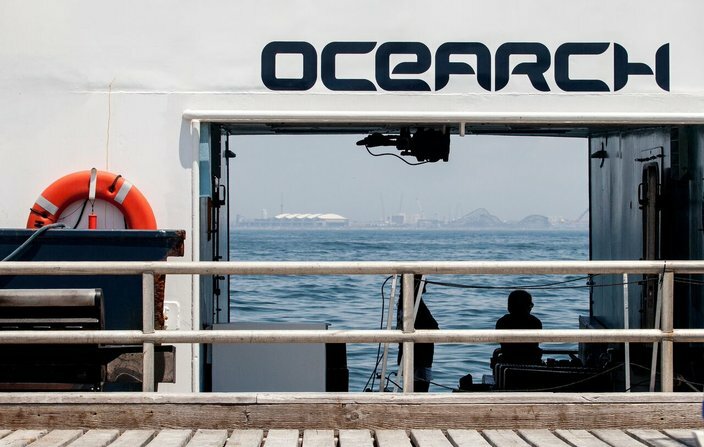 She spent a day aboard the M/V OCEARCH recently, searching for Mary Lee. Allen is a photographer, nature blogger, and something of a bay rat, happy banding ospreys or saving diamondback terrapins when not surfing with her French bulldog or spending a day on the water with a professional crabber. "I have always been fascinated by nature. Crossing turtles, raising tadpoles and watching fireflies as a kid never got old," she said. "Photography has allowed me to explore the natural world even deeper, and by sharing images through blogging and social media I am trying to do my part to show others how important it is to protect and appreciate biodiversity. "The crew and the scientists shared their research and we checked out the equipment and tags that they use. I was literally standing a few feet away from the platform that held Mary Lee and the dozens of other sharks that have been tagged." 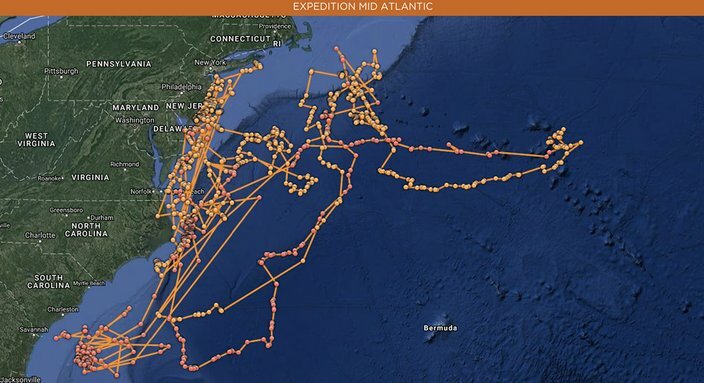 The map shows Mary Lee's track over the past two years. The great white shark spends a considerable amount of time off the Jersey coast this time of year. Allen interviewed OCEARCH expedition leader Chris Fischer for a recent blog post about the adventure. “Mary Lee is hitting events on a calendar year after year accurately,” Fischer told Allen. • The shark's schedule revolves around events such as bluefish blitzes, striped bass runs and seal haul-outs. • New Jersey is special to white sharks because the coast serves as a nursery where shark pups – 4.5 feet and 45 pounds – “grow up.” He expects to see white shark numbers surge as they recover from overfishing due to since-banned gill-netting. • Driving a car or a tractor is far more dangerous than swimming near sharks, said Fischer, who noted that all species of shark combined to kill about a dozen humans annually, worldwide. On the other hand, humans kill about 100 million sharks every year. But still, “she owns it wherever she goes,” said Fischer of Mary Lee's role as an apex predator. If you’d like to keep track of nature, especially at the Shore, you can read more or even sign up for Allen’s blog here or follow her on Instagram @soozi3q. And you can keep track of Mary Lee’s track here or follow her via Twitter @MaryLeeShark. She has 124,000 followers. And by the way, Shark Week on the Discovery Channel begins Sunday and runs through July 30.